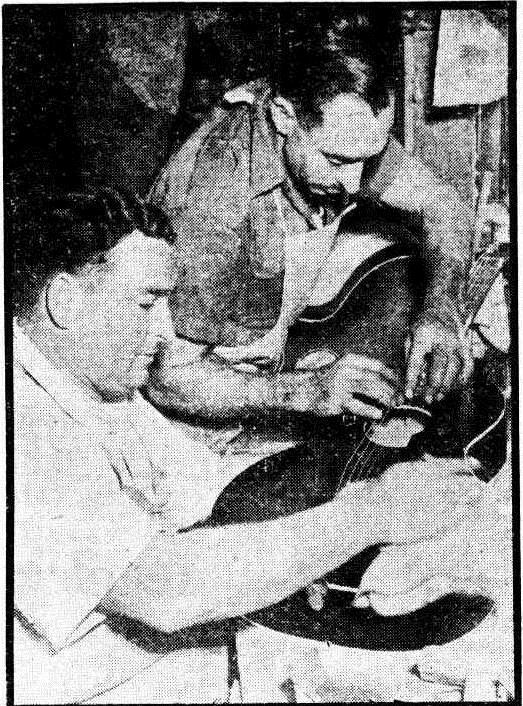 The Daily News (Perth) on 16 May 1950 reported how Les O’Connell and Jack Maskiell, both former POWs in Changi Prison, began making a ukulele in Changi to past the time. They used a knife, coconut shells and bits of old tea chests to make their first ukulele. Upon returning to Western Australia, they took six months to build their first uke for sale. Their ukes sold well in Australia and South-East Asia, and by 1950 had sold 3000 ukuleles and 700 guitars. The craftsman at left is John Hetherington, at right is Jack Maskiell. Robert Edwards was an illustrator of magazine stories, but was dissatisfied with this lucrative lot. He took up futurist art, but this led to cubism and post, post impressionism, which, as the reporter for the The Sun (15 July 1917) said, would have led to drink and desolation. What saved our bohemian of Greenwich Village from this dismal fate? The ukulele! 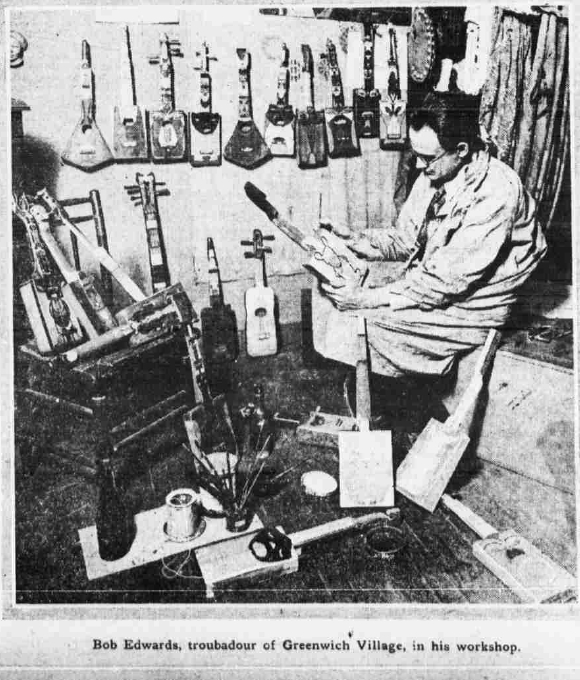 And not any ukulele, but hand-made box ukuleles (and ukuleles of other peculiarly proportioned prisms), which he decorated with futurist art works. He took his first creation to a local restaurant and sang a song. A fellow customer asked regarding the ‘fiddle’ he was playing, and ended the brief conversation with the offer to buy the object for $25 (about $1250.00 in current coin) — SOLD! — and our suffering artist never looked back. Some time around 2o March 1904, a Hawaiian newspaper reported that the ukulele and guitar shop of Jose Do Espiritos Santos was burgled. Eight young fellows, Hawaiians and Portuguese, where fired upon by a constable as they made their escape — none were harmed, but one was recognised and detective McDuffie made his arrest the following day. The two who were caught gave up the others. This was their second visit to the ukulele and guitar shop. In January of the same year they had liberated five ukuleles, five mandolines, and a guitar. In their latest hit, they got four ukuleles, a banjo and a guitar. Most of these were recovered from the shops that had been helping the boys unload their loot, which, apart from ukuleles and lesser stringed instruments, included bags of rice, boxes of soap, other sorted groceries and a revolver. They published the names of all who were allegedly involved. 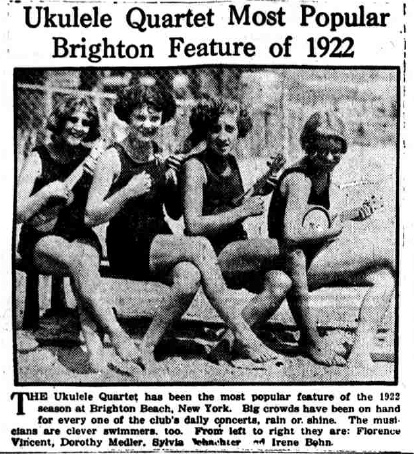 The Evening Independent reported on 30 July 1924 that ukulele fever had hit Berlin hard. Germany wanted a ukulele in every home. The uke was promoted with special musical tunes, “Ukulele Heinie” and “Try Me on Your Cat” [must have lost something in translation], as examples. Every ukulele sale contributed to the paying of war reparations, as Germany put a big sales tax on musical instruments, it seems, for that purpose. Fredrick Galloway confessed to killing Andrew Pashuta in San Jose on the night of 22 May 1926. Galloway, a deserter from the army, had met Pashuta through their interest in playing the banjo ukulele. Apparently they had an argument, and Pashuta threatened to reveal Galloway’s whereabouts to the army. Galloway used the crank of Pashuta’s car to kill him, and then dumped the body in some trees, returned to Pashuta’s house, stole his victim’s ukulele, drove south, dumped the car and sold the ukulele. Galloway, in fact, had left a trail anyone could follow, and he was soon arrested. He confessed to the murder. At his first trial, Galloway was condemned to death, but he won a retrial and his sentence was commuted to life in prison. Galloway decided not to contest that decision, fearing that he might be given the death penalty again — public opinion was hot at the time, as there had been a number of murders just then in the area. All I can say is that we can be thankful for starter-motors in cars (cranks were used to kick-start old cars), because we can’t be sure that arguments won’t break out even between ukulele players. The Toronto Star 20 March 1945 was dismayed to report that the ukulele was unfit for use in the South Pacific. Brought up to associate those tropical islands with hula girls and ukuleles, the reporter learnt from Ms Belmont (founder of the Metropolitan Opera guild no less) that ukuleles fall apart there. I wonder what she was doing with the uke… Oh, and nothing was said as to the stability of hula girls. The first of these instruments was the Edwards ukulele made in two models and dealers acclaimed it the greatest hit in ukulele history. Each bears Cliff’s autographed trade-mark. They achieved immediate popularity. Following these numbers with the other two models bearing the endorsement of two of the world’s greatest musical comedy stars, names known to all theatre goers and phonograph record buyers. Progressive dealers are now recognizing these instruments as a wonderful business-getting combination. I’ve never heard anyone anywhere (except in the MTR) refer to these instruments. A quick google has revealed nothing … except this so far. Reproduced courtesy of The International Arcade Museum and the Musical Box Society International. Ukuleles, banjos, mandolins, violins and other stringed instruments are urgently needed for wounded service men in the Fox Hills Hospital, Staten Island, according to an appeal issued yesterday to the people of the city by Mrs. Edward McVicker, New York County chairman fo the National League for Women’s Service. A “cheer canteen” will be opened for the men on November 18, to help them while way long winter months, and the dearest wish of the wounded veterans is to have a “ukulele band.” There are 2,500 men in the hospital, most of whom have been there a year or more. Imagine trying to add a column of figures a yard long while a squad of brain distractors whistled, strummed on ukuleles, banged on pianos, sounded automobile horns and beat time with their feet on an oaken floor! But 300 girls did this thing today in a concentration contest at the William Penn High School for Girls. All of them survived the ordeal, but many suffered considerable mental agony before it was through. The first problem in the contest was a brain-racking one in addition. The girls were handed a column of figures that would have staggered an intrepid double-entry bookkeeper. The ukuleles tuned up immediately the girls started. Ragtime music on pianos strove to push the young women from their mental speedways, and piercing whistles jumbled up figures on the mental blackboard and made contestants start all over again. After the stunt in addition, the girls were given some knotty problems in quadratic equations, linear equations, simple interest, percentage, factoring and bank account. And all the while it was a running skirmish of 300 agile brains with noise. The way those tantalizing ukuleles upset calculations and piled up figures and equations in distorted heaps was a spectacles that would have rumpled the patient spirits of the pedagogues of old. I always knew ukuleles had a place in education.